Fide Master (2006); International Master (2013). Asian U8 champion 2005, World U10 champion 2006 (which gained him his FM title), Asian U12 champion 2008, Asian U16 champion 2012. 2nd at the 2012 U16 World Championship behind Urii Eliseev. Apr-17-10 I play the Fred: If this person ever plays against Anish Giri, there will be confusion. Apr-30-11 shivasuri4: One gets the feeling Girish has already started to stagnate.Else he is probably just concentrating on his studies now. Aug-09-11 waustad: He's close behind Rombaldoni in the World Junior Champs, and he's really young! wordfunph: 14 y/o FM Koushik winning against 3 GMs and so far 6/7 in World Junior hmmmm.. He's 13(!! ), not 14 until August 31. Girish claimed another GM scalp in round 8, this time beating GM Nils Grandelius (2542) in 36 moves. Simply awesome! Aug-22-11 shivasuri4: Though Girish collapsed in the second half of the World Juniors,he still stands to gain 70 points and will move from 2309 to 2379 in the September list.Let's hope he continues his progress to become a GM after gaining the remaining norms. Aug-24-11 Xeroxx: Once you go Girish you never go Giri. Oct-31-11 shivasuri4: Girish is struggling in the U-16 Olympiad.Playing on the second board for India,he has logged 4/9 for a rating performance of 2177,thereby losing 29 points(so far). 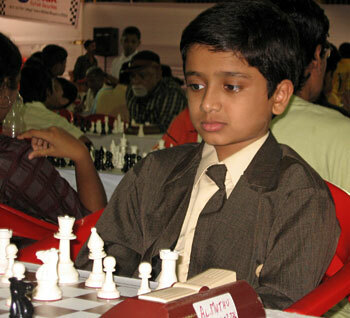 Nov-21-11 shivasuri4: Oh dear,Girish continues to struggle,now in the U-14 section of the World Youth Chess Championship.Seeded 4th,he has so far scored 2.5 points from 4 rounds(tied 43rd place),losing 16.5 points.Let's hope he rebounds soon! Nov-29-11 shivasuri4: Girish finished with 6.5 points out of 9 in the U-14 section of the WYCC,placing 12th.He lost 16.5 rating points from the event. Nov-22-12 shivasuri4: Girish scored 8.5/11 to secure the silver medal in the U-16 section of the WYCC. This will give him 30 rating points, and hence a career-best (so far) rating of 2397. Jan-02-14 shivasuri4: Girish won the silver medal for the second year running in the U-16 category of the WYCC, losing out to Murali Karthikeyan on tiebreak. Both the players scored 9/11, staying undefeated. This event takes Girish to a new career rating high of 2430.